Rough Edges: Forgotten Books: Agents of Atlas - Jeff Parker, Stan Lee, et al. Forgotten Books: Agents of Atlas - Jeff Parker, Stan Lee, et al. Like a lot of comics fans of my generation, I was a huge fan of writer/artist Jim Steranko's legendary run on Nick Fury, Agent of S.H.I.E.L.D., first in STRANGE TALES and then in Fury's own comic book. The issues-long battle between Fury and the villainous Yellow Claw was probably the high point of the STRANGE TALES run. I thought it was great stuff. But I had no idea at the time that it wasn't the first appearance in the Marvel Universe of the Yellow Claw and his stalwart nemesis, S.H.I.E.L.D. agent Jimmy Woo. Similarly, I thought it was a pretty good story when Roy Thomas introduced the hero known as Marvel Boy in the pages of FANTASTIC FOUR but didn't know that that character had appeared previously, too. I wasn't aware of any of that until an issue of WHAT IF in the 1970s delved into the history of those characters. A few decades later, that same issue of WHAT IF inspired writer Jeff Parker to revive the Yellow Claw, Jimmy Woo, Marvel Boy, and others from the Fifties in a mini-series called AGENTS OF ATLAS, because in those dark days between the end of the Golden Age (when Marvel was known officially as Timely Comics) and the beginning of the Silver Age (when the company we now know as Marvel Comics was born), the company was called Atlas Comics. I recently came across a trade paperback reprinting of the AGENTS OF ATLAS mini-series from 2006 that also includes the first appearances from the Forties and Fifties of the characters, along with the issue of WHAT IF that inspired their rebirth. I must have read that issue of WHAT IF because I read almost everything Marvel published in those days, but I have no memory of it, and this was my first time to read the mini-series and the other stories. The Agents of Atlas are the above-mentioned S.H.I.E.L.D. agent Jimmy Woo, who started out working for the F.B.I. ; Marvel Boy, an Earthling raised in an alien colony on Uranus (and yes, the name of the planet is the subject of several jokes); Namora, the cousin of Prince Namor, the Submariner; Venus, apparently the Goddess of Love her own self, come to Earth and taking human form; M-11, the enigmatic "human robot"; and my favorite among them, soldier of fortune Ken Hale, who is transformed by a witch doctor's curse into an intelligent gorilla known as (what else?) Gorilla Man. As you can tell, this is a pretty oddball group that reminded me slightly of the early days of the Doom Patrol, one of my favorite DC comics from the early Sixties. 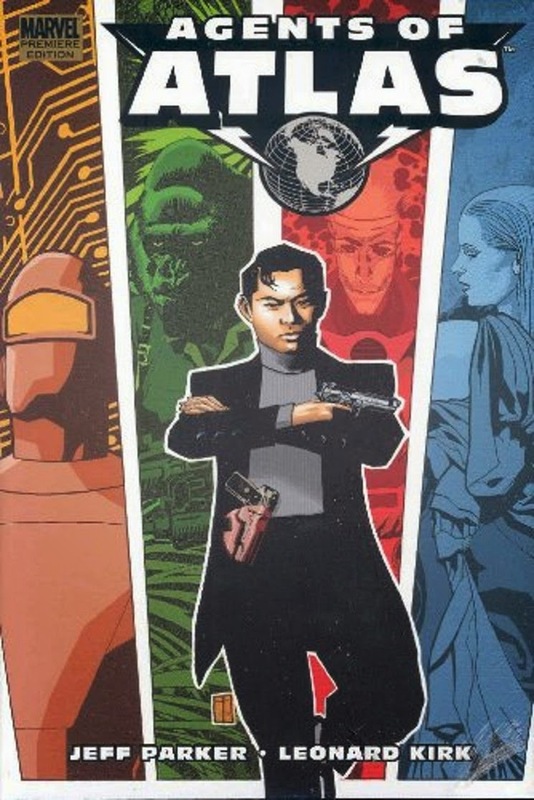 The main storyline in this collection, the mini-series from 2006, is a modern-day story that finds the agents regrouping into a team to help Jimmy Woo take on a vast, shadowy criminal organization known as the Atlas Foundation. It's a lightweight, fairly fast-moving and entertaining story. The script by Jeff Parker and the art by Leonard Kirk are both good, and hey, how can you not like a story that features an intelligent gorilla firing four machine guns simultaneously? Maybe you can resist the appeal of a scene like that, but I can't. It's a shame Gorilla Man never got his own series, even though I doubt that the exploits of a superspy gorilla would have been very successful. I would have read it, though. The reprints of the stories that introduced the characters in the Forties, Fifties, and Seventies are fun in a nostalgic way, too. The best of them is probably the one from THE YELLOW CLAW #1, with art by the great Joe Maneely and a script by Al Feldstein, better known for his work on MAD. The Human Robot story was written by Stan Lee and drawn by John Romita, who both went on to do much bigger and better things a few years later, of course. Overall, AGENTS OF ATLAS is a nice little trip into the past for those of us who remember those days. If you're a comics fan of a certain age, you'll probably enjoy it like I did. I'm ordering AGENTS OF ATLAS Right Now! I sometimes get lost in the vast MARVEL Universe, but I'm always entertained by the characters and fun plots. I hope you enjoy it, George. The Marvel Universe is ending in a couple of months, and that'll be it for me. The one thing I really liked about Marvel as opposed to DC with its endless reboots was that the Marvel Universe, despite all the retconning, was still basically the same universe as it was in the Sixties. If that's going away, I have no interest in whatever they replace it with. My comics reading will consist of a few titles from the smaller companies and reprints of stuff I enjoyed thirty or forty years ago and stuff I missed thirty or forty years ago.